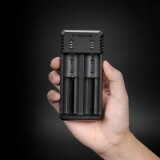 Nitecore UI2 2-slot Li-ion Battery Charger supports simultaneous charging and independent control of each slot. Features light weight and portable size, you can put it in the pocket and use for outdoor charging. 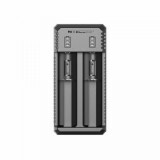 Nitecore UI2 2-slot Li-ion Battery Charger supports simultaneous charging and independent control of each slot. Features light weight and portable size, you can put it in the pocket and use for outdoor charging. Nitecore UI2 2-slot Li-ion Battery Charger comes with max charging current of 800mA each slot and innovative over-discharged li-ion battery activation, can not only test the battery situation automatically before charging, but also do the automatic adoption for the optimal charging mode. 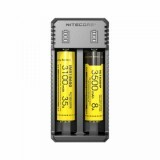 Integrated with multiple compatibilities, the Nitecore UI2 is compatible for 3.7V rechargeable Li-ion batteries and also available for large-sized 20700, 21700 batteries. More importantly, it is made from durable and fire-retardant pc materials and features multiple charging safeguards which is certified by CE, RoHS, FCC, KC and C-TICK. 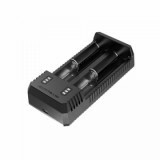 Get this charging to start safe vaping! 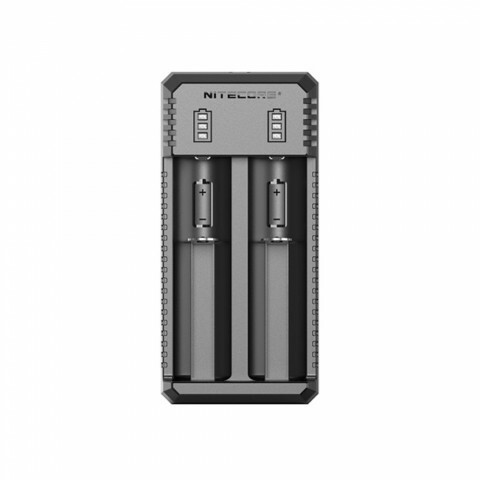 • Nitecore UI1 1-slot charger, Nitecore UMS2 charger, Nitecore UMS4 4-slot charger are also available in BuyBest.